Aptly named, the newest SPECTACOLOUR 1054FC is an extremely bright LED-based RGBW fixture designed for long throw applications and is powerful enough to illuminate large architectural facades or canvas entire stage areas. The SPECTACOLOUR 1054FC utilizes the extremes of cutting edge LED technology and its rugged design allows installation in any environment. With an output of over 20,000 lumens and maximum projection distance of 800ft/275m, this powerful fixture is perfectly suited for entertainment, architainment and architectural applications of any scale. The new generation of powerful exterior lighting and color changing architectural wall washers is topped by the latest SPECTACOLOUR 1054FC, a high density LEDs double configuration modules range which features the newest 10w 4 in 1 high power LEDs for smooth seamless color change. 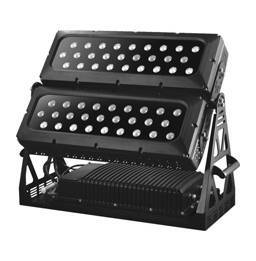 The double cluster of LEDs configuration in the SPECTACOLOUR 1054FC offers full independent digital control of each LED array, allowing absolute freedom to create matching or divergent effects on formerly prohibitive large scale facades and remote spots. The standard version with a combination of RGBW LEDs (red, green and blue) offers an unprecedented astonishing rich saturated light output quality. Maintenance costs are significantly and dramatically reduced by the IP66 certified protection rating coupled with the very long life span of the latest solid state lighting package, as well as by the total absence of moving parts and color filters and by the convection cooling system for the added bonus of a totally silent operation. 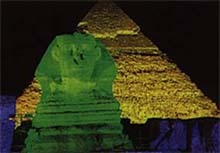 A variety of beam angles are part of the optical group selection. We offer narrow beam for long throw, medium beam for medium throw and wide beam for flood/wash applications. A list of the various possibilities of beam angles is available below and we are open for customized beam angles where needed. The two heads have an independent tilt that allows to lighting up wide big surfaces such as facades using lenses with different beam openings. For instance, it can be used with lenses with medium opening on one head to light up the lower part of a building or structure and at the same time it is possible to use narrow beam lenses to light up the rest of the building or structure. The SPECTACOLOUR 1054FC series can truly turn the newly illuminated areas into signature locations for an unparalleled standard defining architectural lighting achievement. The SPECTACOLOUR 1054FC is equipped with PWM. PWM (Pulse Width Modulation) driving electronics is currently the only optimal technology appropriate for LED drivers. Other manufacturers increase input electrical current to boost the brightness of LEDs, at the great expense of LED reliability. With transformers, if one LED burns out, the next LEDs in a series would pass out in succession. PWM eliminates those issues. The SPECTACOLOUR 1054FC has PWM electronics integrated to safeguard the longevity of LEDs. The R&D team has put a lot of effort on ventilation design of this model. The new design in ventilation systems consist of: 1. Copper PCB soldered on heat sink 2. Air flow ventilation tube attached on the heat sink. With this design, the conductivity of heat is more than 2 times better than combination of aluminum PCB + ventilation glue + heat sink. The temperature found on the heat sink is normally only 5 degree less than the junction temperature because of the efficient heat conductivity. This solution makes the fixture able to run on full-duty cycle without drop in brightness and no need to lower the driving current, and ensure the life of LED. The SPECTACOLOUR 1054FC is designed for outdoor and indoor applications. 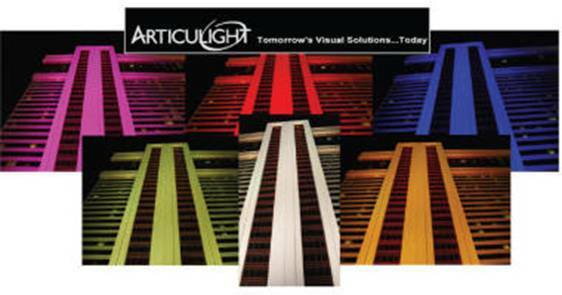 Suitable applications include wash and effect lighting for architectural, entertainment, display and retail uses. The SPECTACOLOUR 1054FC can be also installed for use in signage and advertising using the dynamic functions available with DMX 512 control. Direct input of DMX 512 signal allows the fixtures to be controlled from any DMX512 controller. The SPECTACOLOUR 1054FC can be operated as a single unit or in multiple units for large applications. Whether you are in a band, part of a stage performance or just want to add color washes with RGB infinite color mixing possibilities to any lighting installation, the SPECTACOLOUR 1054FC is the perfect solution to brilliantly light up any stage or surface. The SPECTACOLOUR 1054FC is also performer friendly because it emits almost no heat onto the stage thus entertainers will stay cooler on stage. Just add the SPECTACOLOUR 1054FC punch and you have got the optimal stage light show! With a very long lamp life, the fixture will need virtually no servicing (only regular outside cleaning of front lenses to make sure light output is strong) and produces the highest quality of output without color fading. The SPECTACOLOUR 1054FC has an auto switching power supply that can accommodate a wide range of voltages. The only thing necessary to do before powering on the unit is to make sure the line voltage supplied is within the range of the accepted voltages. The SPECTACOLOUR 1054FC will accommodate between 80v and 240v AC. All fixtures must be powered directly off a switched circuit and cannot be run off a rheostat (variable resistor) or dimmer circuit even if the rheostat or dimmer channel is used solely for 0% to 100% switch. The SPECTACOLOUR 1054FC has been designed to replace 2500W HID color changers. It brings to the table a lot of advantages among them flexibility of beam positioning, more lens options, greater creativity opportunities, higher light efficiency, greater energy saving, lighter weight, much higher IP rating, much lower power consumption, much higher lamp life all those factors resulting in an overall superior fixture that not only outperforms its 2500W HID CYM predecessor but also saves on many fronts. We are talking about 21st century fixture replacing a 20th century fixture. In projects where there is no need for color change, and only static color is needed, the SPECTACOLOUR 1054FC can be used to replace existing 1500W HID light source fixtures or where HID might have been considered. The SPECTACOLOUR 1054FC MONOCOLOR has an advantage that it’s simple to install, operate and maintain while projecting light that can reach up to 1200 ft (365 meters) depending on color. DMX Channels: 12 / 9 / 4Ch. Completely silent, the projector is cooled by natural air convection not fan; plus the 400Hz LED scan rate makes it also a perfect choice in TV studios.